Couche de finition Seche Vite Dry Fast / Duo Duo de base transparent. 1x couche de base transparente 0.5 oz. 1x couche de finition 0.5 oz. Seche Vive. Bring your manicure to life with Seche Vive Instant Gel Effect Top Coat. Instant Gel Top Coat 0.5oz/14ml. Prolana - Nail Optimizer. 5oz. Made in USA. We promise we will work with you directly to resolve any issue you may have. Will not diminish shine or dull colors and only replaces those ingredients which have evaporated from the bottle. UPC 809217020012. Country of Manufacture United States. Ne diminuera pas l’éclat ou les couleurs ternes et ne remplace que les ingrédients qui ont disparu de la bouteille. Country of Manufacture United States. SECHE VITE. Bring your manicure to life with Seche Vive Instant Gel Effect Top Coat. Prolana - Nail Optimizer. 5oz. Dry Fast Top Coat 0.5 fl oz. Made in USA. We promise we will work with you directly to resolve any issue you may have. NAIL LACQUER THINNER 2oz/59ml. Will not diminish shine or dull colors and only replaces those ingredients which have evaporated from the bottle. Prolana - Nail Optimizer. 5oz. Made in USA. We promise we will work with you directly to resolve any issue you may have. Non diminuirà brillare o colori spenti e sostituisce solo quegli ingredienti che hanno fatto evaporare dalla bottiglia. UPC 809217020012. Country of Manufacture United States. Bring your manicure to life with Seche Vive Instant Gel Effect Top Coat. Seche Vive is specially formulated to fuse with natural light to provide added strength and an enviable gel-like finish with an intense, prolonged shine. Will not diminish shine or dull colors and only replaces those ingredients which have evaporated from the bottle. Nail Salon Supplies Nail Polish. Will not diminish shine or dull colors and only replaces those ingredients which have evaporated from the bottle. Nail Salon Supplies Nail Polish Thinner. SECHE CLEAR. Seche Clear Base Coat is a crystal clear base coat that creates an unsurpassed adhesion to all natural. Disguises nail imperfections. Crystal Clear Base Coat 0.5 fl oz. Prolana - Nail Optimizer. 5oz. 1x Clear Base Coat 0.5oz. 1x Top coat 0.5oz. SECHE BASE RIDGE -FILLING BASE COAT PROFESSIONAL KIT SECHE BASE. IS SPECIALLY FORMULATED TO ENHANCE THE PERFORMANCE OF THE WORLD’S FINEST DRY FAST TOP COAT ,SECHE VITE. ALWAYS USED A BASE COAT. SECHE BASE. Has an incomparable bonding ability and is specially formulated to giveSeche Vite™ the best anchor to hold onto. Apply to properly prepared nail plate. RIDGE FILLING BASE COAT 0.5oz/14ml. Seche Clear Base Coat is a crystal clear base coat that creates an unsurpassed adhesion to all natural. Vite Dry Fast Top Coat 0.5 fl oz. Disguises nail imperfections. Prolana - Nail Optimizer. 5oz. Crystal Clear Base Coat 0.5 fl oz. 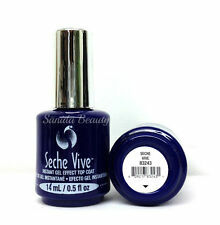 Seche Vite Dry Fast Top Coat is acknowledged as the world's finest top coat. Apply thickly, get a nice bead on the end of the brush, then set softly down on the first nail painted and watch how Seche Vite flows over the wet nail polish self levels and will not drag or streak the underlying manicure. This formulation is ideal for pedicures. Seche Vive Instant gel Effect Top Coat 0.125oz x 3pcs. SECHE VITE. Once per week (or more often if needed) check the consistency of yu=our 0.5oz bottle of SECHE VITE. 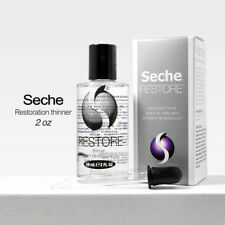 After "restoring" and cleaning your 0.5oz bottle of SECHE VITE, refill from your 4 oz professional size. 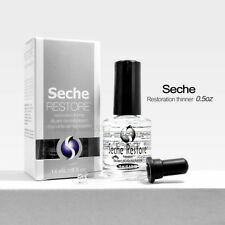 Seche Vite Dry Fast Top Coat Professional Salon Refill Kit, Pick Your Size! Nail Tek Moisturizing Strengthener 2Connected to: Nail Tek Moisturizing Strengthener 2. This item is Seche Vite Fast Dry Top Coat. 5 oz. Adds flexibility to fragile nails. Recondition™ provides extra conditioning for nails that are hard, dry and brittle. This special. Gel Polish. necessary to resist stress and enhance durability. This formulation is ideal for pedicures.